makeup | i’ve been having a little look round my muji storage for old gems that i may have forgotten about and it’s been working quite well. i feel like i’m going shopping every time i go to do my makeup! MAC paint pots in groundwork and bare study have been making a appearance quite a lot this month. i always forget how much i love using them and how well they stay on the lid due to their cream to powder finish. using groundwork in the crease works so well, as it’s a great natural shade to add depth and definition. 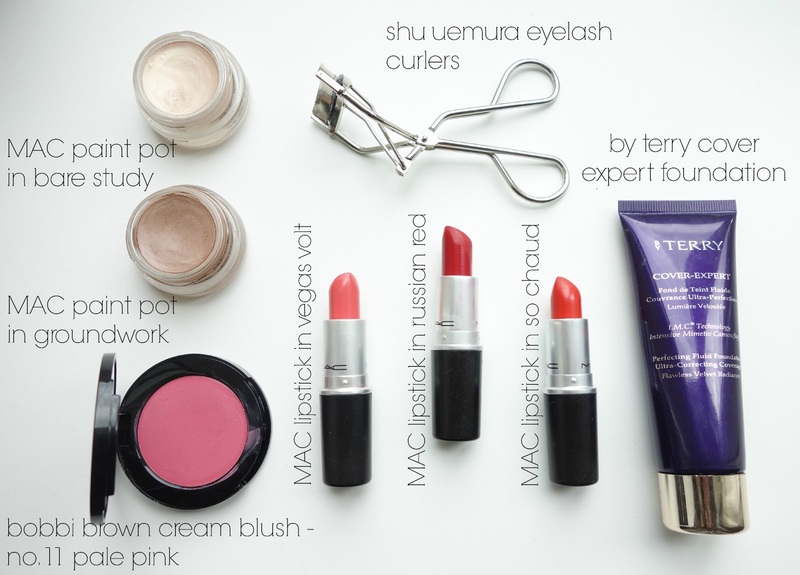 to finish off my eyes i’ve been addicted to the shu uemura eyelash curlers, which i was skeptical about at first but they’re really worth the hype! they create a nice curl that makes the eyes look bigger and more awake, especially when used with l’oreal false lash telescopic mascara. for my base, i’ve been addicted to the by terry cover expert foundation as it’s so light on the skin, yet offers medium-full coverage and never looks cakey. it’s really impressed me and i think it’s worth the (quite high at £44) price. dotting bobbi brown cream blush in no.11 pale pink on my cheekbones creates such a lovely natural flushed look to the skin and it stays in place all day too. 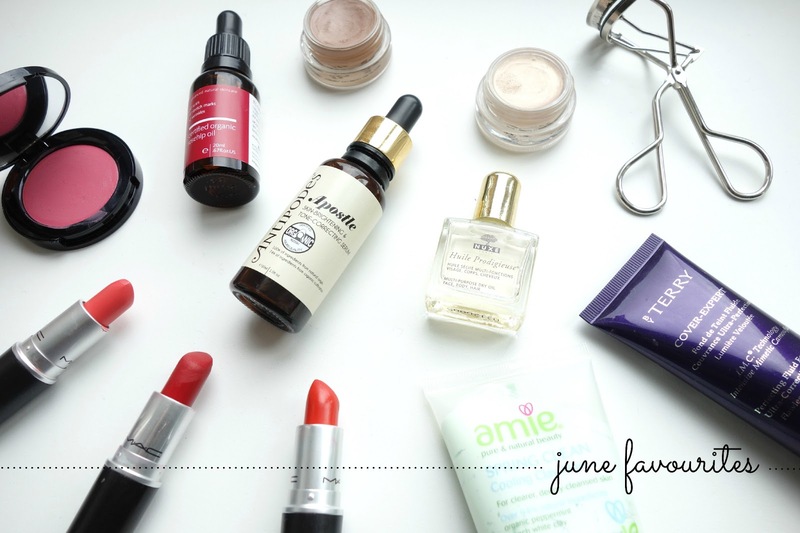 finally for lips, reds and oranges have been high priority this month. my all time favourite MAC russian red lipstick is a the perfect hollywood pout shade. MAC vegas volt lipstick and MAC so chaud lipstick are great orange tones, with the former leaning more peachy yet still packing a colour punch. the matte finish on so chaud makes it last all day too! skincare | my skin has been looking clearer recently and i’m firmly blaming a combination of masks, serums and oils for this. oils in particular have been working wonders, especially since i DIY removed some milia at the tops of my cheeks and needed it to heal quickly! as a mask addict, i find the aime spring clean cooling clay mask* to be indispensable in my collection these days. even if i want to use my more expensive masks, i sometimes apply the aime one on top in more congested areas (chin, nose, forehead) so it feels like i’m getting more of a deep clean without breaking the bank. 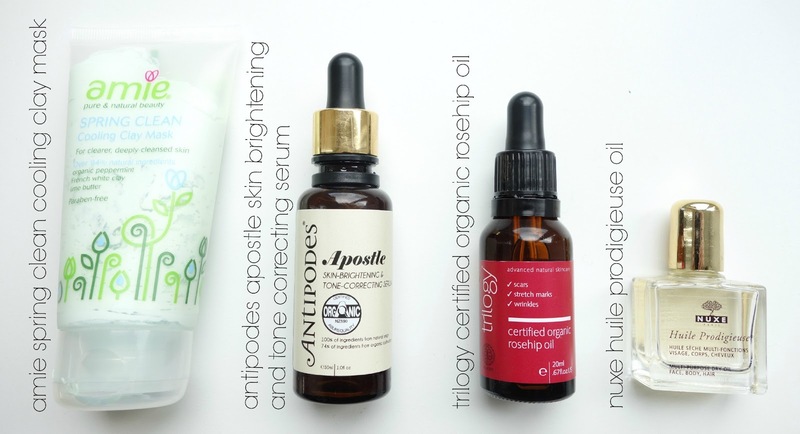 i’ve been converted to serums recently and the antipodes apostle serum has been doing what it says on the tin. i’ve tested it for around 2-3 weeks daily, under my daytime moisturiser and occasionally at night, and it has genuinely worked to brighten my skin. similarly with trilogy rosehip oil, this little gem has been working to really hydrate, decongest and even out my skin and i honestly wouldn’t be without it. at only £14.50 for the 20ml bottle, which will last you ages, i think it’s a bargain. the final oil i’ve been adoring is the nuxe huile prodigieuse oil which i got a 10ml sample of in a space nk goody bag. although i haven’t used this on my face, i have been using it on wet hair and it’s literally the only oil i’ve ever used that doesn’t weigh my hair down. i’ll definitely purchase the full size once it runs out.